The search for a new house was over when this family of four stepped onto this double lot urban oasis. Walking distance to the village, a stone’s throw to the ocean and a west facing private back yard… but what about the house? Built in 1927, designed by locally acclaimed architect Leonard P. James, the house was in fair but tired, outdated condition. After consultation with the designers and project manager of Zebra Group, the new owners decided to preserve and renovate the existing home, because it had the potential to provide the accommodation the family required and the home had a presence within the community that would have been lost if a new home had been constructed. Neighbours have expressed their gratitude for the considerations given to the house, lot, mature trees and original landscaping, now all re-invigorated. With the owner’s desire for a modern feeling to the home, Zebra Group was given the challenge of balancing the traditional Tudor Revival style, with contemporary detailing. By adding dramatic box beams, wide wooden casings and trim to the existing living room and dining area and entry, the somewhat stripped down style of the house was elevated a few notches before transitioning into full on modern overdrive in the new kitchen and great room. Interior finishing includes horizontal grain fir cabinetry in the kitchen, family sized built-in banquette and great room TV wall feature, and a stunning cascading waterfall staircase that is showcased by a storey and half tall glass railing. A continuous distressed wide plank oak floor is the thread that weaves them together. The home takes on a unique texture, a blend of the old with the new, a tapestry of sophisticated elements from the past woven together with the freshness of the future. 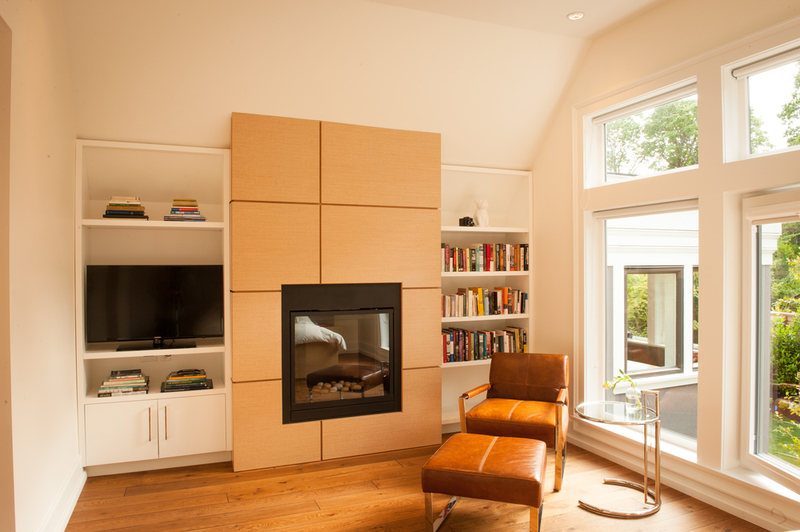 Awards: 2013 CARE Gold – Best Renovation or Restoration over $750,000. 2015 VIBE Gold - Best Residential Renovation over $350,000.